Illustration by David Jimenez. Original photo: Hoxtonboy. Nobody can really tell you with any certainty how rapidly oil production will decline once we pass the peak — although some people are still willing to make an educated guess. The optimists would like to see production continue along a plateau for decades, followed by a gentle, rather graceful decline. This way there would be ample time for us to reorient our economies and alter our modern way of life. Pessimists fear a rapid drop in oil production and severe economic impacts that would make the current financial crisis and recession look mild. Either way, we clearly need some kind of action plan to proactively respond to a world where oil is no longer cheap and plentiful, and where we can ill afford to continue to spew out carbon dioxide without regard for the how our climate will change. The launch of the Totnes Energy Descent Action Plan (EDAP) this month is an event that we should all follow with great interest. Totnes, a town of around 8, 500 people, is the United Kingdom’s first transition initiative. That ‘Now is the time to act’ sentiment infuses the plan, which was launched on 7 May 2010 in the local town market, and written/compiled by Jacqi Hodgson with support from noted permaculturalist and Totnes local Rob Hopkins. It is first time that such a plan has been designed for and by a local community. On the topic of food security, a working paper was produced that looked at land use patterns, the quality of the agricultural land and food zones and concluded that while it may be possible to provide enough fruit and vegetables for the local population, supplying cereals and meat would be more difficult. The analytic work underpinning the plan is excellent, and it looks great too. In that they have succeeded. The plan is very engaging because it is written in accessible English. There are lots of references to every day life and as a result it really connects with the reader. It is a plan with personality and a sense of fun; perhaps not what you would normally expect from something called an Energy Descent Action Plan (EDAP). You may be surprised to learn that Totnes is not the first place to produce a peak oil related plan, although it is the first (and perhaps only) community-based energy descent plan. Forward thinkers elsewhere have been tackling questions of peak oil, climate change and energy descent head on for some time and have produced peak oil preparedness plans. The starting point for these plans goes back to Hopkins’ time as a permaculture lecturer at the Kinsale College of Further Education in Ireland. It was there that he first came across the peak oil concept and wanted to work with his students to see if he could apply permaculture principles to design possible solutions. The assignment for the students was to develop an Energy Descent Action Plan for Kinsale. They put the plan together in 2005 and what started out as a student exercise became a rapidly growing and very successful Transition Movement. Since then there have been many action plans developed, including from Portland, San Francisco, Oakland, Berkeley, Bloomington and San Buenaventura in the United States, and most recently from Bristol in the UK (see list below with links to download the reports – if you are aware of other plans we would be happy to hear from you). These action plans tend to be supported by the local authorities and are somewhat technical in nature. They read, in some instances, like disaster preparedness plans and begin by identifying the various risks and vulnerabilities, before putting in place response strategies and resilience measures. The Totnes plan is different and is all about community engagement. The plan took about one and a half years to prepare and over 500 people were involved in workshops and discussions. Producing such a comprehensive plan is an achievement in itself. 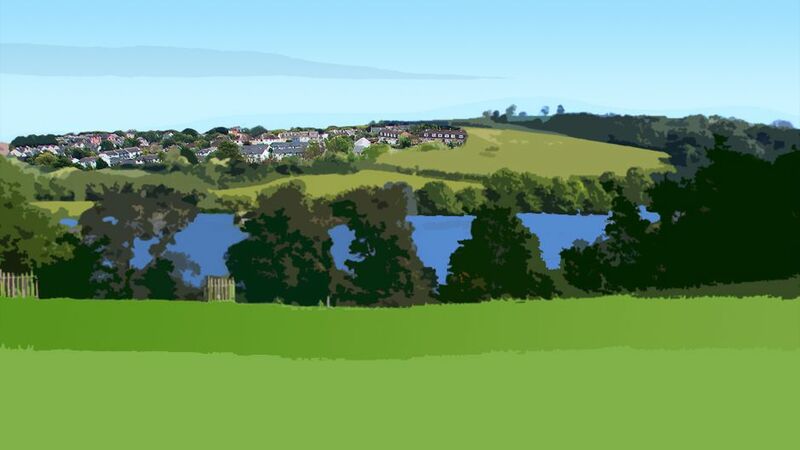 It builds upon the activities already underway in Totnes, such as the Atmos project to create a radically low carbon development providing work, leisure and homes for up to 500 people, the establishment of the Totnes Renewable Energy Supplies Company and a development of new eco-school. We asked Hopkins what the next steps are likely to be. He is concerned, however, that it may be difficult for larger towns and cities to follow the Totnes approach and has been wondering how the energy descent plan would look for a town like Leeds for instance with a population of 500,000. Perhaps there would need to be a neighbourhood-based approach. Or as we see in Vancouver, the city can be sub-divided into villages, perhaps reflecting the situation in the past. It is still too early to tell how successful other cities like Portland or San Francisco have been with their energy descent planning. One thing on his mind at the moment is why there have not been more EDAPs when the growth of Transition Towns has been so rapid (there are now nearly 300 official Transition Initiatives, and another 130 communities mulling over the idea). Perhaps one explanation for the small number of EDAPs so far is that the process may overwhelming, especially for larger towns and cities. “What the Transition Movement is really doing well is engaging with the community. We are really good at that. “The beauty of the Transition Movement is that we can take risks and need not be concerned about failure. In fact we encourage failure, because that is how we learn. “There is so much happening and these actions are really important given the pressing nature of the challenges we face. Overall, it is essential that we (all of us) start to think more strategically about these challenges and start to look for innovative and creative ways forward. Transition Town Totnes Plans For Energy Descent by Brendan Barrett is licensed under a Creative Commons Attribution-NonCommercial-ShareAlike 3.0 Unported License. Great article. I truly hate to haul out such a hackneyed phrase as “a picture is worth a thousand words”, but the the Totnes “past, present, future” images (see embedded link in article) were really compelling. I wonder if/how/when the Transition Movement in the Western countries will work with Eastern efforts, including Japan’s fledgling Satoyama Initiative. There are so many overlapping areas of concern and there will undoubtedly be great opportunities for collaboration going forward. Thanks for the comment Alan. I totally agree that it would be fascinating to see a merger of Western and Eastern efforts on responding to peak oil and the promotion of Satoyama. The ideas are very similar and hark back to a more simple, but very rich life.